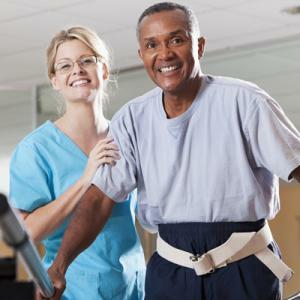 Rehabilitation therapy services aim to restore residents to their highest level of functioning. Rehabilitation therapy services aim to restore residents to their highest level of functioning.Whether you are in need of short-term stay or long-term care, our skilled nursing communities are designed to promote rehabilitation in a high-quality and compassionate environment. Physical therapy is designed to relieve pain and enhance health. Occupational therapy strives to equip patients with the necessary skills—and often, customized tools—for proper self-care, such as dressing, personal hygiene, and cooking. Speech and Language Pathology assists residents in achieving improved quality of life through assessment of language, swallowing, and/or cognitive disorders. As a resident, your needs and preferences shape your experience, from food choices to recreational activities. We are committed to helping you feel at ease, at rest, and at home. 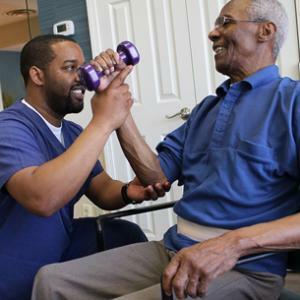 Looking for rehabilitation therapy in the comfort of your home? Please consider our Home Services division, Eden Health. Injury and illness can take a toll on the body’s strength and mobility. Physical therapy is designed to relieve pain and improve mobility, balance, transfers, and range of motion. Our physical therapists help residents reach their highest level of independent mobility and learn how to prevent injury. They instruct patients in skilled techniques to improve the ability to walk, climb stairs, and increase physical stamina. They also assess the need for specialized equipment that may improve self-reliance and safety. Of course, there is no one-size-fits-all technique, which is why our physical therapists consider each resident’s medications, conditions, and desired outcomes to develop the most suitable, individualized therapy plan. Reducing fall risk is a primary concern for our residents. Muscle weakness, limited mobility, and foot pain all increase risk for falls, and physical therapy can target each of these issues. Physical therapists focus on improving balance, strengthening muscles in the lower extremities, and reducing pain to prevent falls. Building muscle strength can help reduce fall risk and is also beneficial in granting residents more independence. Physical therapists guide residents through safe and effective exercises to achieve their desired outcomes, such as easily lifting groceries, holding children, and moving around living spaces. Chronic pain can lead to reduced mobility, depression, and sleep problems. Physical therapists work with you to restore movement and help your body heal by targeting the issues behind pain, which is critical for improving quality of life. Physical therapists also educate residents on ways to minimize pain in the future. For short-term or post-acute residents, occupational therapy helps prepare to return home. An occupational therapist might address activities of daily living and provide education on energy conservation and task simplification. 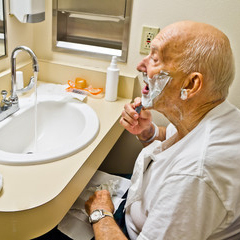 An occupational therapist may also evaluate the resident’s home for safety after discharge and then recommend and teach the person to use adaptive equipment, such as a shower chair or a walker, how to care for themselves safely, and how to pursue regular activities—like cooking or driving—as they continue recovering. For long-term residents, and those with memory or cognitive disorders, occupational therapists focus on adapting activities to keep the resident as functional and independent as possible, providing them with dignity and enhancing their quality of life. Occupational therapists might provide equipment to assist with activities, modify the resident’s environment to maximize independence, and facilitate the resident’s participation in the center’s activities. Speech and Language Pathologists assist residents in achieving improved quality of life through assessment of language, swallowing, and/or cognitive disorders. Speech Language Pathologists collaborate with physical therapists, occupational therapists, nursing, and family members regarding ways to improve a resident’s cognition, communication, and swallowing function. Each resident is different, and requires different levels of care and focus in various areas. Speech Language Pathologists can teach individuals how to improve swallowing by working and strengthening their muscles thereby reducing the chances of choking or inhaling food or liquid. For residents with dementia, Alzheimer’s, stroke patients, as well as other diagnoses that can affect memory and cognition, speech language pathology evaluates the resident’s condition so that caregivers and families can engage in quality communication with these residents. Techniques include simplifying instructions, offering visual aids, developing memory books, and a host of other recommendations. We work to foster continued meaningful communication with our loved ones.